1. Remove outer husks from corn but not all. Pull back and remove all silk from the corn. Close the remaining husks back and soak in water for 10-15 minutes. 3. Finely mince radishes, serrano chili (discard seeds for less heat), onion and garlic clove. Combine with coarsely chopped cilantro and tomato. Squeeze the juice from lime and add rice wine vinegar and tequila. Add corn kernels to salsa and season with a pinch of salt and pepper. 4. Combine garlic powder, kosher salt, cumin, coriander, chili powder and oregano. Rub spice mixture on elk, cover with plastic wrap and let marinate for 1 hour before cooking. Remove from refrigerator and let meat come to room temperature prior to cooking. 5. Heat cast iron skillet to medium-high heat. Add 1 tablespoon butter and sear meat on all sides until you get a rich dark coloring. Remove elk from skillet, cover loosely with foil and let rest for 10 minutes. Slice elk backstrap into thin slices being sure to cut against the grain. 6. 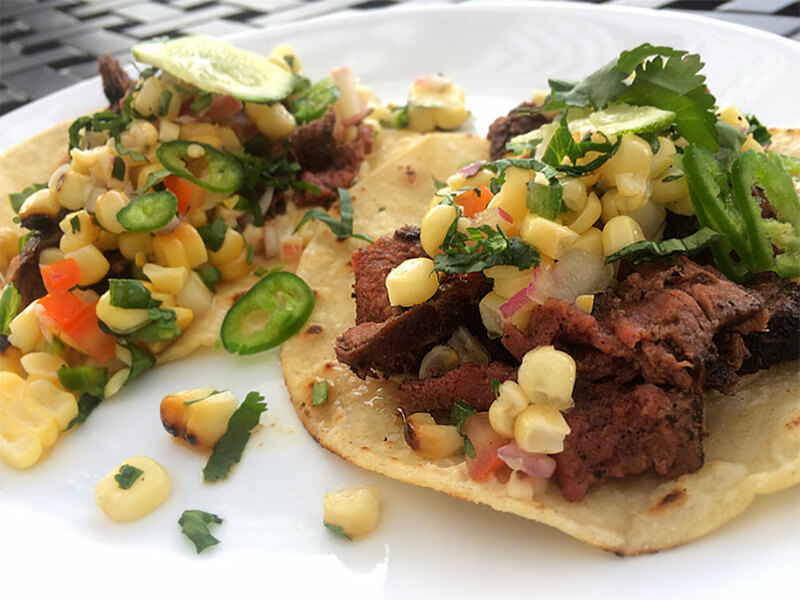 Serve sliced elk in a warm corn tortilla and top off with a generous portion of grilled corn salsa. For more elk venison recipes, please visit NevadaFoodies.com.